So gobble it up and wash it down with some wine! “Assorted Flavors” is an art exhibition about variety. By its very nature, art is meant to elicit a feeling or response in the individual who perceives it. But art is not experienced through sight alone; it can be experienced in all of our senses- including sound, smell, taste, and touch. 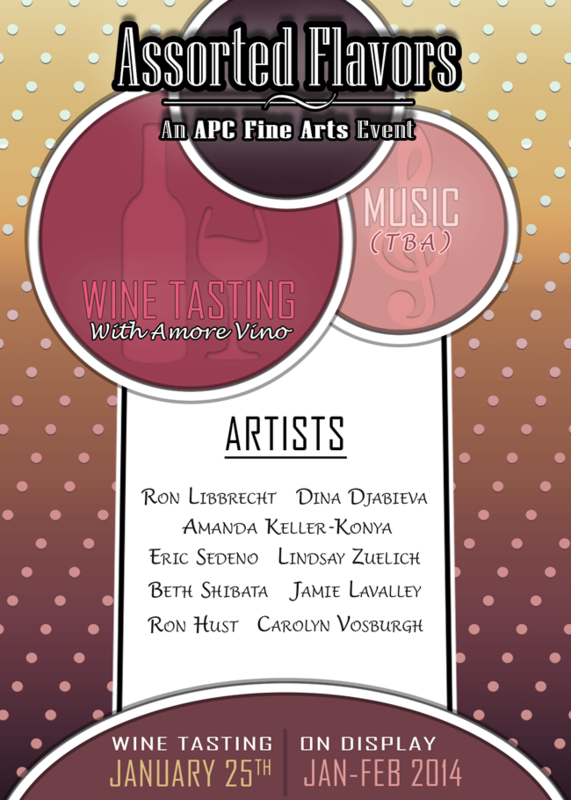 APC Fine Arts invites you to enlighten your senses with a variety of visual arts, live music, and a selection of wines to stimulate your palette, thanks to our neighbors at Amore Vino here in Old Torrance. For those interested in delicious wines, Amore Vino offers wine by the glass [$5], a selection of 4 wines to sample [$5], and will have bottles available for purchase. Prepare your appetite!